Hope's Cafe: Running Out of Room? 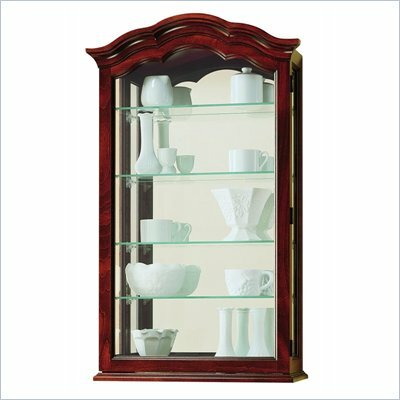 You Need a Curio Cabinet!! I have been doing some (long overdue) spring...er....summer cleaning lately. And while cleaning, I just realized how much junk I have! Even though I have thrown out what seems like a ton of stuff, I still have a lot more that I just can't get rid of. Candles that have only been used a couple times, figurines that I have been given through the years...sentimental display pieces that have overtaken my dresser, desk, and anywhere else I found a place to put them! So, since I've been working with Cymax, I immediately realized what I need-a couple curio cabinets! If I could get just 1 or 2 of these in the house, I could completely clear off my bookshelf and desktop, yet still have all the pieces displayed in a prominent place. And they'd be protected behind glass, too....great for when little kids come over who weren't taught what don't touch means! 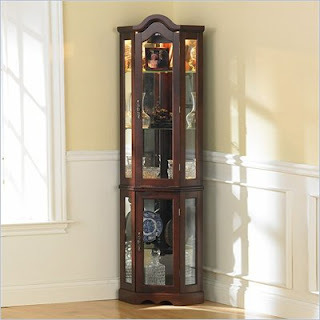 I really love this wall mount curio cabinet. Elegant in it's simplicity, it holds and displays without drawing attention away from what is inside. And, in addition to the hanging cabinet in the bedroom or maybe the study, I think I need this corner curio cabinet in the living room. This would be perfect for displaying all my neat little knick-knacks so people can see-but not touch! All those special little pieces would have a safe place to rest and be enjoyed without taking over my house! If you, like me, need a curio cabinet in your house, you need to check out More Curio Cabinets. Disclaimer: I have not received product from More Curio Cabinets. All thoughts and opinions are mine. I'd love to have a curio cabinet. I have a lot of pretty things that I'd like to have safely behind glass. I also think a corner would be very handy. I have always wanted a corner curio cabinet like that. Maybe someday I will splurge for one. I have started looking at garage sales for some but haven't found one I like yet. I don't have a TON of stuff, but I could fill 1 or 2 up!